Putting Renegade Rowing to the test over 2k! In competition and training there is usually a prescribed time domain whether it’s a Chipper, AMRAP, Distance, or RFT setup. When you’re training for competition or focused on achieving a goal/standard it helps to know you’ll have the energy and mental toughness required to perform for that entire time domain. A 2k requires full commitment both mentally and physically for 6 to 8 minutes depending on your ability. In preparation for our next 2k test and other summer competitions, we will be training this time domain at least once a week to focus on the intensity and mentality needed on race day. 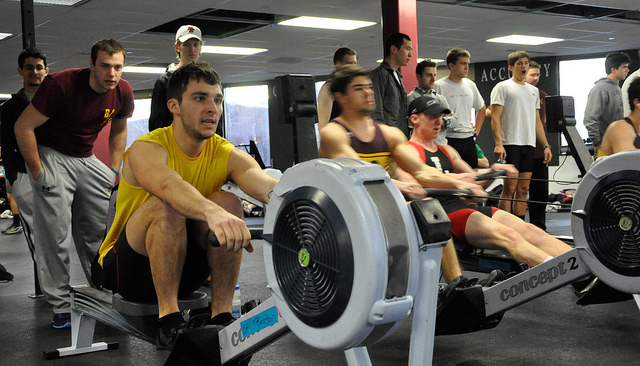 Today’s Rowing WOD should be performed at high intensity as if it were race day. Be sure to get a good warmup in that includes a few bursts at race pace. The first 750m should be completed as if it were a 2k race. Get a good start, 7-10 high strokes, and settle to your goal 2k pace. You should be focused on efficient rowing that allows you to hold one split and one stroke rating all the way through. During the 15 burpees focus on breathing and resetting your mind for the next 750m. The burpees should be a fun challenge because they require a little accuracy to hop onto the plate without missing it. The plate will ensure you’re being consistent with the work you do each rep. As you start the second 750m dig deep and be ready to fight mentally with positive self talk. The second 750m should be performed like the third 500m of your 2k. The third 500m of a 2k is your opportunity to reach your goal. If you can crush your splits in the third 500m of a 2k you will crush your goal. Reaching your 2k goal starts today. Get after it! Post the number of complete rounds plus additional meters/reps to comments! This entry was posted in Fitness, Rowing, Strength and tagged endurance sports, exercise, functional movements, healthy-living, row 2k, rowing, sports, training by Renegade Rowing. Bookmark the permalink.